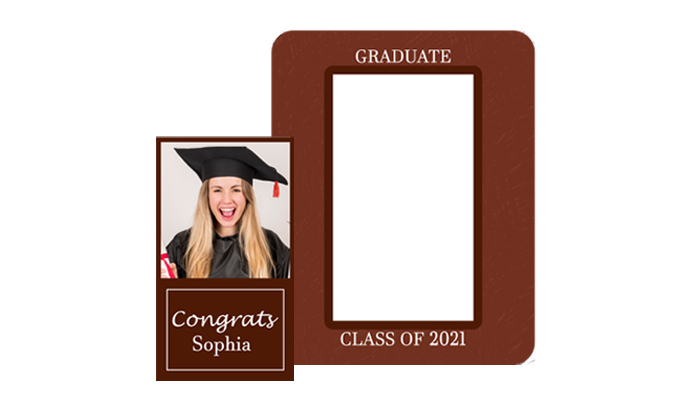 Announce your graduation in style through these personalized 3.5 x 4.5 picture frame rectangle punch graduation announcement save the date magnets – 20 MIL. These magnets easily help you to build emotional rapport with the viewer due to its design. Featuring a 2 x 3.5 punch out area in the middle, this magnet easily becomes one memoir rather than plain announcement. It can be offered during family events, celebrations or even stand perfect for mailing. Request a quote to know discounts that you can avail on bulk ordering these custom 3.5 x 4.5 picture frame rectangle punch graduation announcement save the date magnets – 20 MIL. Additional Information – This price is inclusive of printing in full-color (four color process) on one side. Pantone® color match not available in full-color Not made for outdoor use. Write-on/Wipe-off surface not available.